This was another gift from my good friend Gene. It’s funny that I reviewed 22 Oktoberfest beers last year and I missed getting this one and I here it is one of the best. So lets get started and see what Hacker-Pschorr Oktoberfest has for us. The nose nice with rich caramel almost toasted malt aromas and floral hops. Ahhh that’s a nice Oktoberfest! There is a nice caramel malt sweetness upfront then a very pleasant almost creamy mouthfeel in the middle of the sip. The back-end is smooth and very easy to swallow. The finish is fairly dry but there is also a malt aspect to it as well. There are just enough hops to dry the finish a little but there is no bitterness to this beer whatsoever. The final aftertaste is more of a slight lingering malt flavor but this is also mild as well. I’m not sure I did that any justice. 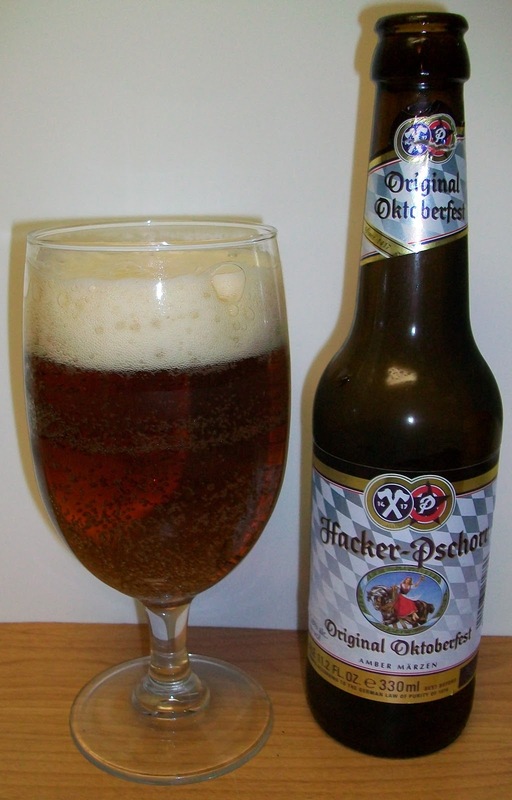 This is really a very good tasking and easy drinking Oktoberfest. The overall flavor is a little lighter than some of the other German Oktoberfest. That’s not necessary a negative, just an observation. I can till you that I’m sorry I just have one of these beers. This is really one of those refreshing beers that as soon as you put the glass down you want to take a breath and pick it back up again. With that in mind I am running out of beer in my glass. This is extremely easy drinking and at 5.8 percent it could catch up on you after a few. We are now at 62 degrees and this beer is actually getting better as it warms. It is much smoother now and there is more of a malt aspect to it. Even with it having richer malt flavor at this temperature it is still a very refreshing beer. The last few sips were at room temperature and still very refreshing with an almost sweet malty finish. I’m going to give this a B. It may be lacking just slightly in flavor from some other German Oktoberfest but it is still a very good beer. This is a very refreshing easy drinking Oktoberfest with a nice toasted malt flavor and a light floral hop finish.